Calf Creek Recreation Area near Escalante offers an interpretive trail to the enchanting 126-foot high falls, past native Indian rock art, beaver pools and towering sandstone cliffs. Calf Creek Recreation Area includes the famous 126 foot high Calf Creek Falls which are reached along a pleasant hike past Navajo sandstone cliffs and Native Indian petroglyphs. Calf Creek Canyon is a narrow gorge bounded by sandstone cliffs with a year-round stream which is home to many beavers. The hike to the falls is 2¾ miles each way along a sandy interpretive trail which can be difficult in places. Other attractions include the Upper Falls which are more difficult to access, and the campground. Calf Creek Recreation Area UT is 15 miles east of Escalante, along Hwy 12. It is approximately 2 hours drive east of Bryce Canyon National Park, between the small towns of Escalante and Boulder. $5 Day Use Fee. Hiking from the parking lot to the Lower Calf Creek Falls is along sandy track which is a designated nature trail with numbered informative stops. The scenery in the colorful Navajo sandstone canyon is breathtaking. Along the way see Indian ruins, rock art and historic artifacts. Hiking to the Upper Falls is through desert terrain and over sandstone slickrock along a tough trail from the main highway for 3 miles. The picnic area is at the campground on Hwy 12 and has picnic tables, playground, water and toilets. 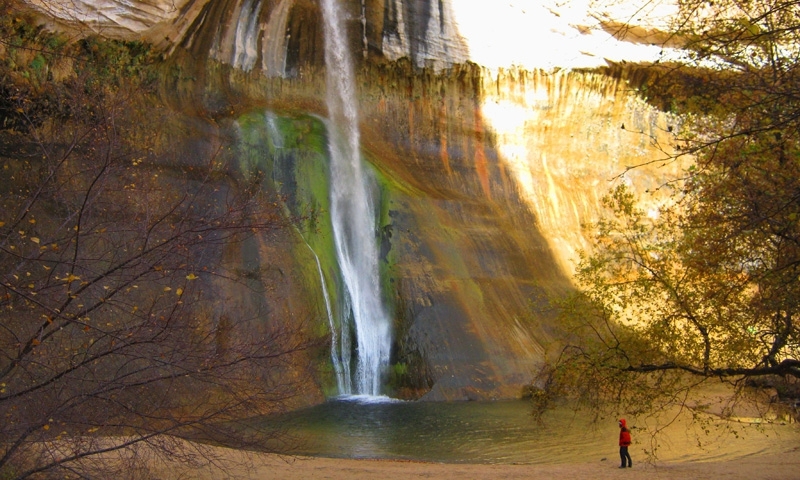 The Lower Calf Creek Falls create a pool which is popular for swimming and bathing. Along the edge is a beach suitable for youngsters to paddle and cool off. Many birds inhabit the canyon including the hummingbird, downy woodpecker, golden eagle, mourning dove, western bluebird, flycatcher and common crow. The Anasazi and Fremont Indian farmed the canyon bottoms and the remains of their granaries can be seen high on the cliffs east of the creek. They are at least 800 years old.